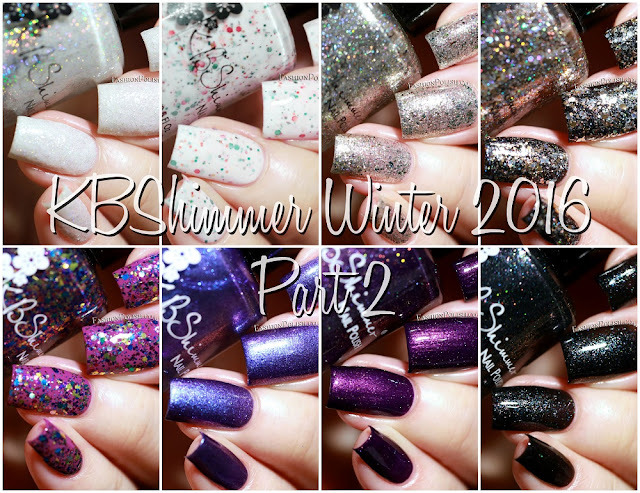 I'm back today with the second half of the KBShimmer Winter/Holiday 2016 collection! If you've missed the first half yesterday, do not fret, you can read all about them here. Yeti Or Not is a very pale gray crelly with iridescent and holographic glitters. It has a sugary finish that mimics snow to perfection and can render formula a bit tricky to work with so make sure that the first coat is fully dry before applying a second one. I used 2 coats and no topcoat. Holly Back Girl is a white crelly packed with red and green metallic glitters. I used 2 coats plus topcoat but this is a 2 to 3 coater. Bling In The New Year is a mix of silver metallic flakes with extra pink, green, gold and blue flakes as well as holo microglitters. A great formula for this new addition to the Birthstone finish line. 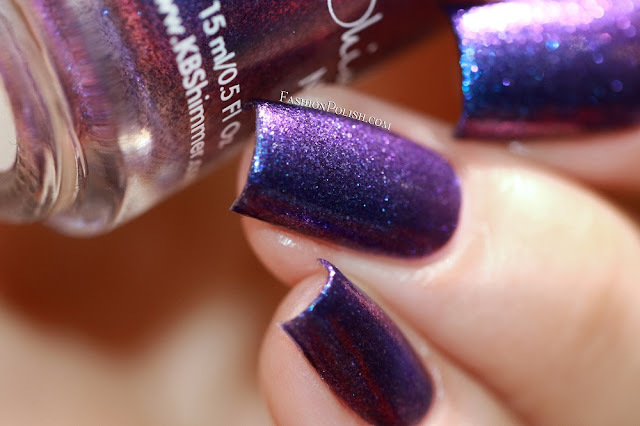 I used 1 coat plus topcoat in my swatches below but it can reach full opacity with 2 coats. Haute Mess is a silver and copper glitter bomb with a touch of rose gold and holo glitters. I used it as a topper over Soot And Ladders in my swatches below but you can also achieve full bling with 2 to 3 coats. Ornamentally Flawless is a jewel toned glitter made of different sizes of turquoise, fuchsia, gold, green and silver glitters. I also used it as a topper (over KBShimmer A Walk in the Park-A), full opacity can be reached with 2 to 3 coats. 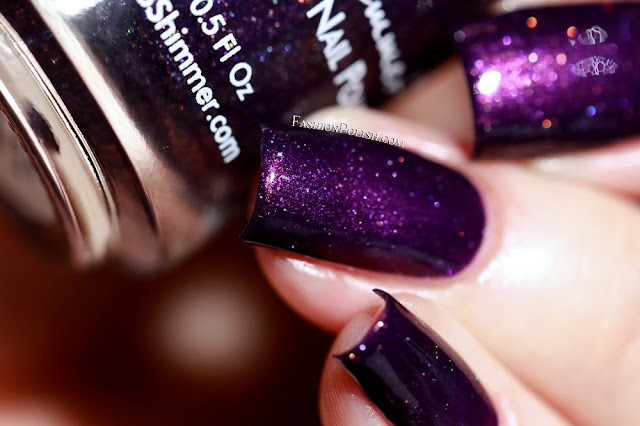 Royal To A Fault is a royal purple filled with micro glass flakes that shift from blue to violet. I used 2 coats plus topcoat. Just Duvet It is a grape shimmer with holo microglitters and a hint of pink shimmery flakes. Formula was easy to work with but on the thin side, requiring 2 to 3 coats for complete coverage. Soot And Ladders is a black jelly packed with a rainbow of micro flakes. Formula was very similar to Duvet It, making it an easy 2 to 3 coater. I keep repeating myself in my KBShimmer reviews but there's just no way to be disappointed with this brand. My top picks: Bling In The New Year, Just Duvet It, Royal To A Fault and Soot And Ladders. A seventeenth shade, Take Me For Granite, is also available as part of this collection but unfortunately my bottle broke during shipping so I haven't been able to swatch it (product listing).